Deliveroo student brand ambassador campaign 2019 from Raptor Marketing on Vimeo. Raptor have been Deliveroo’s student marketing agency of choice since the brand’s conception four years ago. 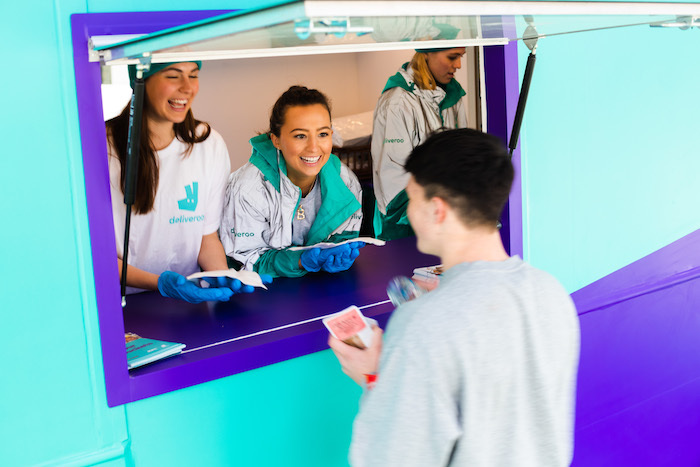 Raptor have supported Deliveroo with building brand awareness on campus, food drops, merchandise distribution and social media campaigns, as well as recruiting new Deliveroo student riders via freshers’ fair activations and student brand ambassador campaigns. The work has helped Deliveroo become the food delivery service of choice in the student sphere and beyond; culminating in Raptor kickstarting the year with their biggest consumer facing campaign to date. The campaign highlight, a branded double-decker bus/ escape rooms experience, will be visiting 17 cities across the UK to give students the chance to escape the experience and achieve food freedom. To support this experience, and others, Raptor have recruited an army of 140 energised, food obsessed student ambassadors to represent the brand and promote Deliveroo on campus both face to face and digitally throughout 2019; a tried and tested formula that has seen Raptor complete over 50 successful campaigns in the last three years. Emily Kraftman, marketing director (UK & Ireland) outlined why the student focused campaign is so important to the brand; “Deliveroo is all about being the definitive food company, anyone who is representing the brand should know and love food. Student ambassadors are a great opportunity to bring the brand to life from day to day, so rather than just seeing us on TV or an OOH billboard they get to interact with people who know and love the brand every day. Raptor Managing Director, David Burgman also outlined the journey Raptor and Deliveroo have taken in recent years: “We are incredibly excited to launch this campaign. Deliveroo were our first client back in 2015 and we have grown with them as an agency. By taking our learnings over the past 3 years together with our love and understanding of the Deliveroo brand, we believe we have developed the ultimate student campaign. Using Raptor’s network of influential student brand ambassadors, society partners and university contacts, together with Deliveroo’s network of restaurants partners we will bring food freedom to students on campus across the UK & Ireland.